One hundred and forty years ago, on 16 May 1864 the Umvoti Mounted Rifles (UMR) was founded in Greytown. There were some 45 men in the original small unit, under command of Capt A.S. Wyndham who was also the Magistrate of Greytown at the time. The unit was known as the Greytown Mounted Rifles. 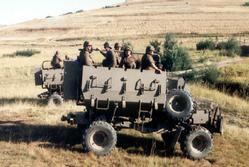 By 1983 this small unit had affiliated with Natal Hussars, ZMR and then became the Umvoti Mounted Rifles, we know today. In 1913, after the advent of the Union, the Union Defence Force act was passed and this led to changes in the entire Defence Force of the Country. Several Regiments lost their identity, but the UMR was fortunate in that not only were they able to retain their identity, but were strengthened by the inclusion of the Northern District Mounted Rifles and the Zululand Mounted Rifles. The unit has served in the following campaigns - the Zulu War in 1879, the Anglo Boer War in 1899 - 1902, Natal Zulu Rebellion 1906, SWA Campaign 1914 - 1915, Western Desert 1941 - 1943 and the 1960 unrest in Natal. 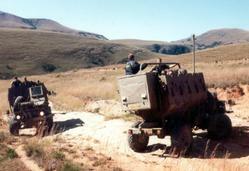 The UMR did duty on the South African Border, South West Africa, when required over the period 1973 - 1988. In addition to the Border duties the Regiment has been called upon to do service in the townships during periods of unrest. In all these commitments the Regiment has lived up to its motto of "Toujours Pret" - Always Ready. It has acquitted itself in a manner befitting a proud regiment of 140 years standing. The UMR since 1910 served under command of the OC, Natal Command as firstly a Mounted Regiment on horseback and then, from 1935 as a Motorized Infantry unit. During World War II the Regiment served as an Infantry unit and in 1954 was converted to a Tank Regiment and subsequently in 1962 the UMR became an Armoured Car Regiment. 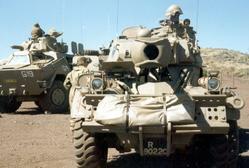 During 1984 the UMR was brigaded as the Armoured Car Regt of 84 Motorized Brigade. This necessitated conversion from a counter-insurgency unit to a conventional force and ended seventy-four years service with Natal Command. 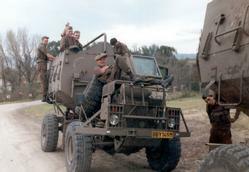 The unit was then the Armoured Car Reconnaissance Regt of 8 SA Div and was then brigaded under command of 84 SA Brigade based in Durban, Natal. 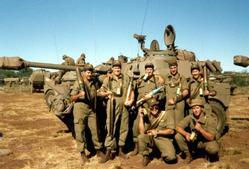 In 1999, 84 SA Brigade was closed and the unit then went under direct command of the SA Army Armour Formation. 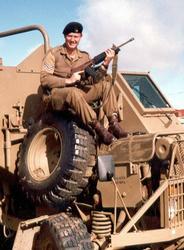 The Regiment was awarded the Freedom of the borough of Greytown on 8 October 1954. The Regiment's centenary was celebrated in 1964 and the occasion was marked by the presentation of new Regimental Colours, and the awarding of the Freedom of the Borough's of Empangeni and Eshowe. 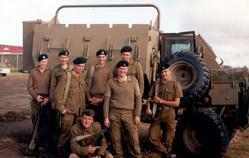 During 1981 the Freedom of Melmoth as conferred on the Regiment. The formation of the second battalion, 2 UMR, was implemented in 1989 under Eastern Transvaal Command but with the rationalization that has taken place, 2 UMR was re-amalgamated with UMR with effect of 1 November 1991. The unit is currently being transformed to reflect the demographics of the country. 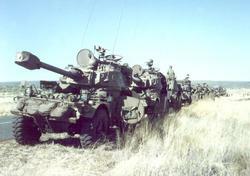 In 1996, the unit converted to the Rooikat Armoured Cars. The UMR has certainly made its mark on the history of SA and what is of special significance, the OC of the Regiment during the period 1899 - 1908 became the first Minister of Defence of the Union of South-Africa, in Gen Louis Botha's cabinet in 1910, he was Attorney General T.F. Carter K.C. There have been six honorary colonels, the first being the then Governor General of SA. The unit has had 35 Commanding Officers. The UMR's performance and ability remains as effective and efficient as its past history testify. The Regiment now faces the years that lie ahead with loyalty in peace and war endorsed by the traditions of the past. Since 1994, after the SANDF was formed, this Regiment has enlisted over 150 members including women to swell its rank to over 200 members, from mainly the KwaZulu Natal Province. In 2001 the Regiment conferred an Honorary membership on His majesty, King Zwelithini Goodwill ka Bhekuzulu as Patron of the Umvoti Mounted Rifles. On 16 May 2004 the Regiment celebrated its 140th year of existence with parades and functions in Greytown, the traditional home of the Regiment.